Holiday clubs are activity based programmes run by churches throughout the school holidays for children and young people. Some holiday clubs are run for church-going children and others are run as an outreach opportunity to connect with children in the local community. Holiday Clubs require a lot of work and need an active and engaged team of people to pull them off. It is also worth thinking about keeping the momentum going in your community all year round, and making sure your helper team keeps growing. World Mission Airways is a new holiday club programme which takes children on a journey around the world to visit some of our church partners and explore the work they are doing. Follow the story of Moses and his journey with God through daily themes of peace, hope, love, joy and justice. This programme includes everything you need to run a full five-day holiday club, including Bible studies, games, crafts, dramas and lots more! Professor Potty’s Time Traveller's Tales is another holiday club programme from World Mission. Over the course of the week, the children will be introduced to different Bible characters and people from the world church that will help them to learn from and explore the themes of: caring for the world; giving; friendship; and health. The Bible Reading Fellowship has a range of holiday club programmes available as PDF Downloads, many with accompanying music. Scripture Union has a large range of Holiday Club programmes. TeamBuilders is a new holiday club programme from Scripture Union which focuses on exciting Bible stories involving Joseph, Moses, Esther, Jesus and Paul. Explore the Now You're Talking holiday club material on Pinterest. My holiday club has finished. What comes next? Making a children’s holiday club a part of your mission plan should be about developing and growing the church in a holistic way that seeks to engage people all year round. 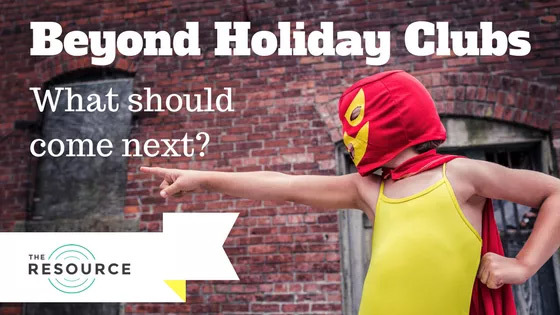 This article about holiday clubs explores what you can do once your holiday club is finished and how to carry on the good work.